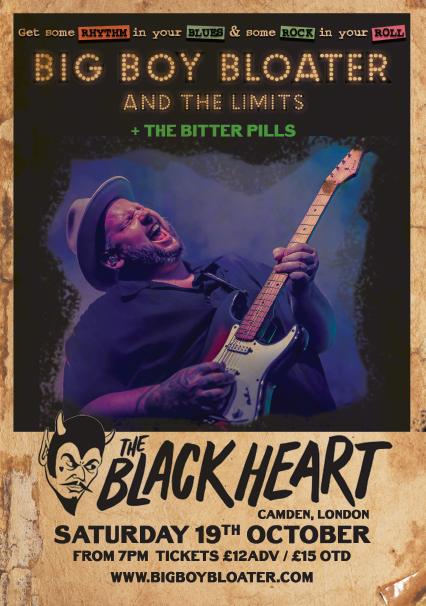 BIG BOY BLOATER and The LiMiTs return to London’s infamous Black Heart for a banging night of Rock & Rhythm & Blues with strange tales of robot girlfriends, swamp monsters and computers taking over the world. Big Boy Bloater has been described by JOOLS HOLLAND as ‘one of the great blues men of our time’ and Classic Rock Magazine calls him ‘the gravel throated don of R&B’! IMELDA MAY, MARK LAMARR & CRAIG CHARLES are all big fans so get yourself down and Big Boy Bloater and The LiMiTs will get your feet shuffling and you face grinning!